A boy with a straw-hat, a weird power and a big dream, that is a fitting description of Monkey D. Luffy, the captain of the most famous pirate crew – The Straw Hat Pirates. I have been following the anime One Piece since its first airing in GMA 7 years ago. I have been easily attracted by its story line and the funny antics of its characters. Since then, I downloaded images from the net to serve as the wallpaper of my computer, I had read and reread the story and episode guides in Wikipedia and leading anime websites, and I just finished watching episodes up to the story arc where Robin was whisked away by government officials in the city of Water 7. One Piece is about the Straw Hat Pirates who travel the treacherous waters of the Grand Line and in the end obtain the ultimate treasure, One Piece. Only the pirate king Gold Roger confirmed the existence of One Piece. Whoever obtains One Piece will be hailed as the Pirate King. 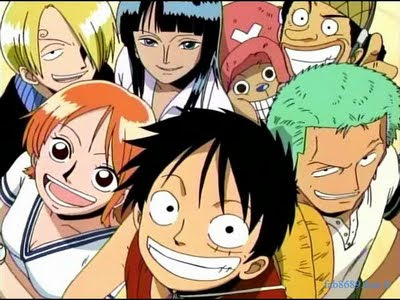 The Straw Hat Pirates are composed of powerful and wacky characters like the Rubberman Luffy, the three swords user Roronoa Zolo, the thieving navigator Nami, the lying sharpshooter Ussop, the love cook Sanji, the reindeer doctor Tony Tony Chopper, and the archeologist/assassin Nico Robin. Currently, the two more characters were added and they are the shipwright Frankie and the skeleton musician Brooke. What I like about this anime is that even though it has circumstances that are out of this world, it does not over exaggerate things. An example of this is Dragon Ball Z where the main characters just go stronger and stronger every story arc that the whole anime was blown out of proportion and became unbelievable. One Piece is a fantasy anime that has the feel of being realistic. Another thing that I liked is that the anime delve in to the inner selves of the characters, so as to help the viewers understand each and every decision that each characters do. One Piece is one funny adventure and the crew fought monsters and different characters with awesome powers. My only problem in this anime is that the Straw Hat crew experienced fatal attacks but none of them died. This is the only thing that I think is the problem of this anime. No major characters die. However, looking largely on the anime in general, it could be said that One Piece is one of the best anime out there. So if you are looking for a fun anime plus great adventures like that in Gulliver’s Travels, then One Piece is recommended for you. Visit Before the Eastern Sunset, and read about my trip to Tagaytay City Picnic Grove. Do you think po papasa na to ?